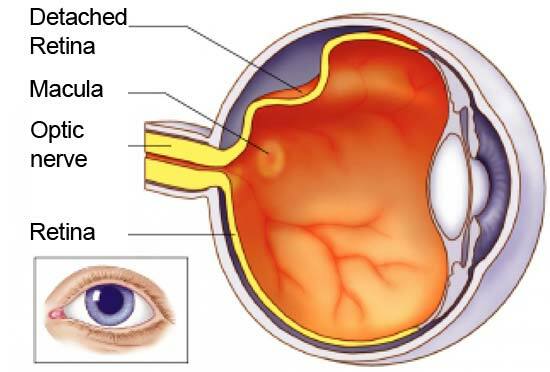 When a retinal detachment develops, a separation occurs between the retina and the wall of the eye at the back of the eye. This is similar to wallpaper peeling off a wall. The part that is detached (peeled off) will not work properly and the picture that the brain receives becomes patchy or may be lost completely. An urgent operation is necessary to replace the detached retina in its proper position. People often describe seeing ‘something black’ or ‘a curtain’, ‘cobweb’ or ‘flashing lights’. In older people, these do not necessarily indicate a serious problem, but the sudden appearance of floaters and flashes requires a full eye examination to exclude the presence of retinal holes or tears. What Causes a Retinal Detachment? Nearly all retinal detachments develop because of a hole or tear in the retina. This usually occurs when the retina becomes ‘thin’, which can occur in short-sighted people, or if the vitreous (the jelly-like substance that fills the eye) separates from the retina. Other eye or health problems such as diabetes and injuries such as a blow to the eye can occasionally be the cause of a retinal detachment. Cataract operations can also cause retinal detachment. What Should I do if I suspect I have a Retinal Detachment? If you think that you have the symptoms of a retinal detachment you should go straight to the nearest eye hospital accident and emergency department.